It’s that time again – the Kansas State Fair is nearing (all too soon for me)! Since there is a new class this year for “Any Hand Knit Item – made with Hand Spun” I feel honor bound to enter something. Back in June, I decided to make the pair of Fair Isle gloves I’d been thinking about ever since I bought several colors of alpaca wool. That seemed like a pretty do-able time frame. Of course, life gets in the way, and this year I can easily blame the record-setting heat wave. We have been spending quite a bit of extra time the past 6 weeks or so trying to keep our rabbits from getting too hot. We don’t have a hope of keeping them actually cool in temperatures up to 112 degrees, but if we can relieve the heat stress and keep them alive, we’ll be satisfied. So far, so good – but it means watering four times a day (eighty-some-odd cages), and usually putting frozen water bottles out for the ones who need it in the afternoon. Anyway, I didn’t get much spinning done for a while. Fortunately for me, gloves don’t take a whole lot of yarn, and Fair Isle knitting goes fast because it’s so much fun! 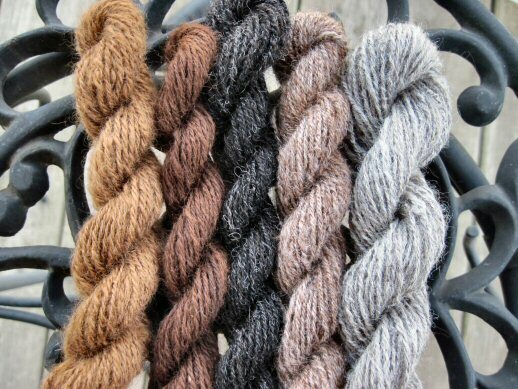 I have just finished spinning and chain-plying the five small skeins of colored alpaca, and am ready to start on the white. These skeins range from 24 to 35 yards. When I took the picture, the dark russet from the alpaca named Mocha had just been skeined, but not washed. Perhaps you can tell that it hasn’t ‘bloomed’ as the others have. They were all spun from the raw wool, which was quite clean and almost completely free of vegetable matter (VM – hay, grass, whatever). The three colors on the left are the darker shades, the two on the right (plus white) will be the lighter background shades. The raw white alpaca fleece looked very dingy, so I washed it first. This was the first time I had tried adding washing soda (Arm & Hammer Super Washing Soda) – and I was very, very impressed with the results. A small amount of the wool washed with Dawn wasn’t satisfactorily clean. Dawn is great for grease, but alpaca fleece doesn’t have the lanolin that sheep’s wool does. After that wash, it just looked wet and dusty. But after adding the washing soda, it practically sparkled! It will require more preparation than the hand teasing I was able to use for the colored wool, though. So this will be the first real test of my refurbished drum carder. Keep your fingers crossed for me. I will also knit some a swatch or two for gauge, then make sure I choose a main design that will fit on the back of the gloves, make several other design decisions, cast on and hope to get them finished in a month!